Scenes of the all-electric SUV Audi e-tron prototype demonstrating its towing capabilities have been shared by the brand with the four rings. 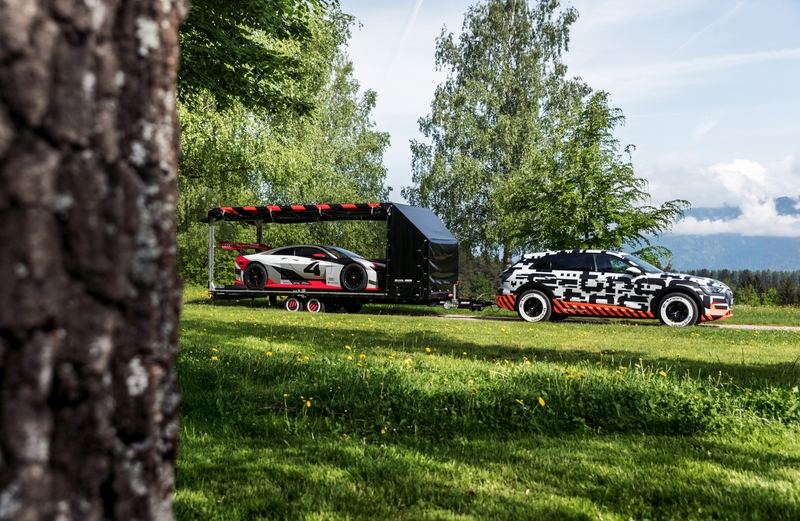 As a prelude to what's to happen at the 37th GTI Meet at Lake Wörthersee, which will be held May 9-12, Audi has released pictures of the sporty Audi e-tron prototype towing a trailer carrying the Audi e-tron Vision Gran Turismo. Originally, the Audi e-tron Vision Gran Turismo concept car was developed exclusively for virtual races on the PlayStation 4, but Audi is making the electric Formula E-inspired race car concept a reality. The Audi e-tron Vision Gran Turismo has been used as a race taxi for the electric racing series. Unfortunately, Audi didn’t confirm the actual towing capacity of the SUV but is certainly something to look forward to, giving us the opportunity to compare it to its nearest competitor, the Tesla Model X which is claimed tow up to 5,000 pounds on 20-inch wheels and 3,500 pounds when configured with larger 22-inch wheels. The Audi e-tron quattro, although dimensionally challenged in comparison, is driven by three electric motors backed by a powerful 95-kilowatt-hour battery pack and is capable of DC fast-charging up to 150 kW, shortening the recharging time to 30 minutes. It is expected to be both quick off the blocks and have competitive hauling capabilities.